The book “The Prophet from Silicon Valley,” has a couple of pictures (p.77) of a custom clear case Sequential Circuits Poly-ONE that was manufactured for promotional purposes. I think it is stunning looking and reminded me of clear bodied Dan Armstrong guitars and basses. 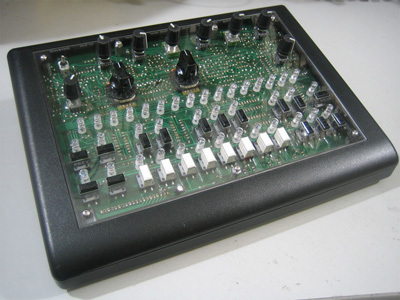 The idea of clear cases and panels that show off all of the guts and workmanship of a DIY instrument is very attractive to me. Has anyone ever encountered any other examples of designs employing clear polycarbonate or Acrylic sheets and blocks instead of metal and wood? Oh wow it looks and sounds beautiful! There were several runs of x0xb0x that had clear acrylic panels. Shruthis used to come in clear acrylic too. 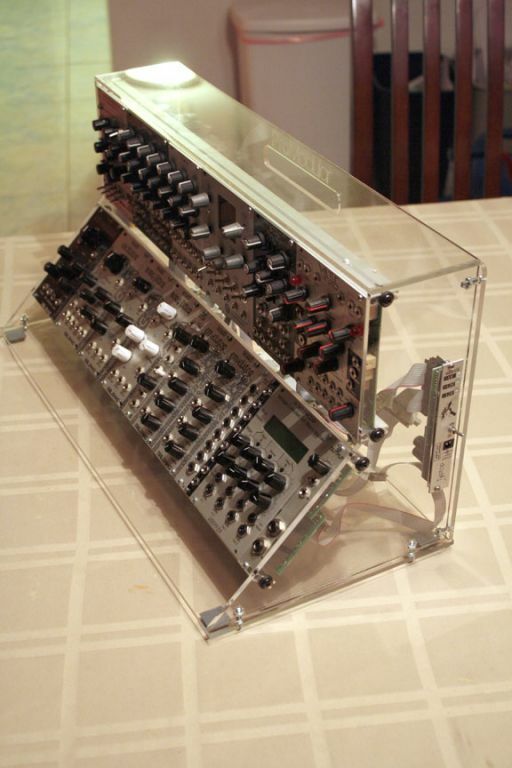 Someone built a whole 5U synth - several cabinets, with clear lexan or something similar. It was (is) stunning. Unfortunately I don't remember the user name, but there are pics on this site of it, somewhere. Maybe look in the 5U forum if you're interested. Edit - found it, after scrolling through 3 years worth of system pics - user is Bryan B, pic here - https://www.muffwiggler.com/forum/viewtopic.php?p=220023#220023 - there are some better ones somewhere else. Oh yeah, I see it. Thanks for finding the thread. I am curious why the user didn’t go with Lexan for the module front panels. 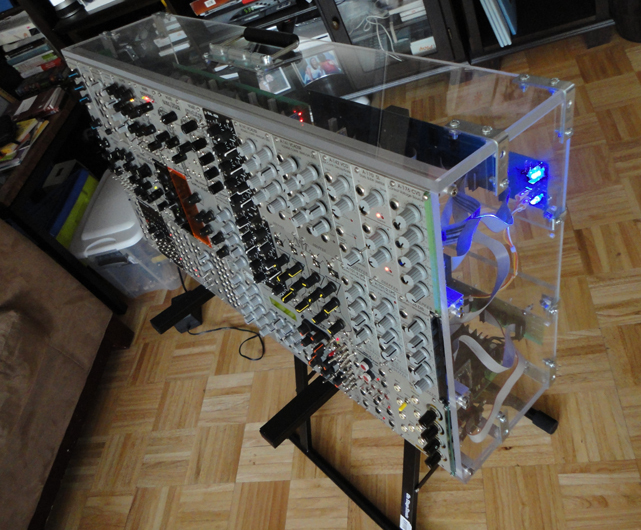 Most of my Eurorack cases are textured plexi, and of course I put colour-fading LEDs inside them. 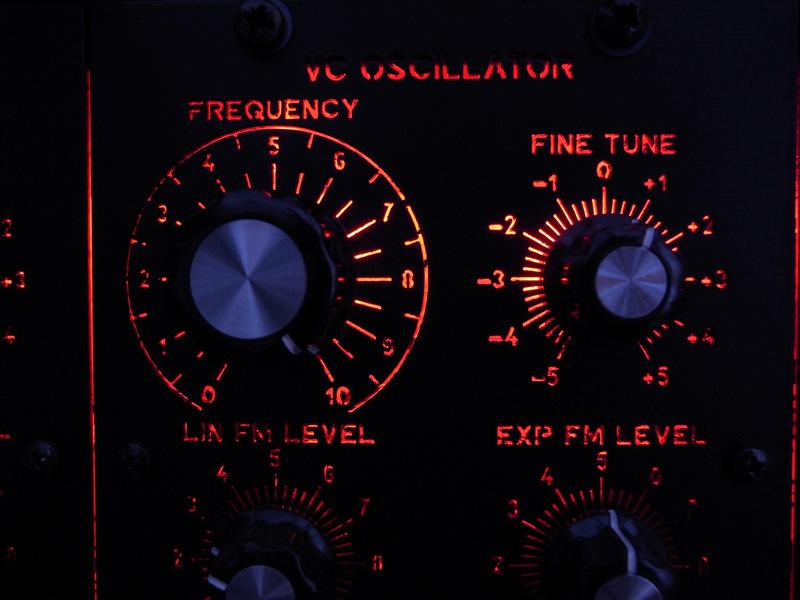 I have also experimented with see-through panels (and more LEDs) and glow in the dark panels. Over-the-top but kinda cool at the same time. Plexi (or acrylic) is challenging to work with. It can shatter easily when cutting, but you can also tap it directly and it will easily hold screws, which is nice. The reason I didn't use it very much for module panels is because it needs to be thicker than aluminum in order to not flex. It's also difficult to read labels on the clear panel. My see-through panels are not clear but you can detect the LEDs lighting up behind them. Front panel Express offers lexan in a variety of colors as one of their options - I haven't tried this yet, but it would be fun to experiment with. Yes I would think that thin Acrylic sheets would be too brittle to drill. Polycarbonate is tougher. 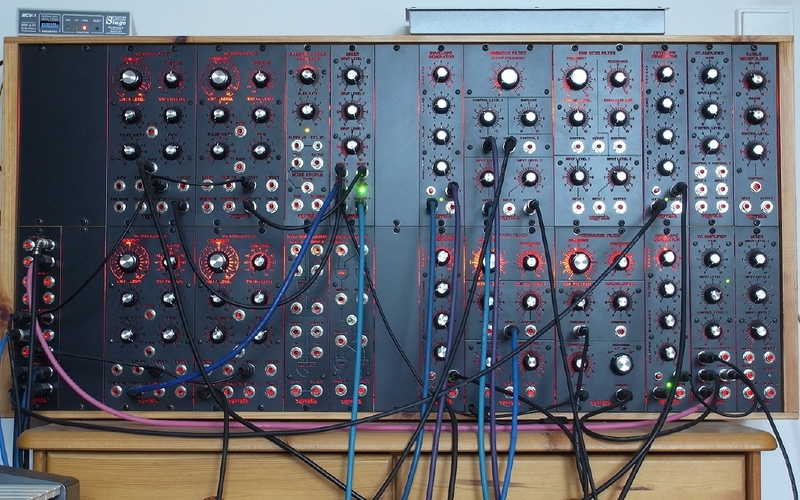 Randy do you have any pics of your modular builds? Its possible to drill acrylic, but one has to be super careful. But one nice feature of thin(-ish) acrylic, so up to 5mm, is that you can use a laser cutter to work on it. If you have a makerspace/hackspace around they might have one. And that makes working with acrylic a breeze. I usually drill a small pilot hole and if I need a large hole, go up in small increments, doing halfway through on each side. I did a short cellphone video so you can see the lights. Randy this little video is an inspiration! I have been scheming and hoarding components for an MFOS build and I think I am going to try making a polycarbonate case and panel for it all. Thanks! If you cut the poly with a table saw, which is what I did, make a cut that goes halfway through, then turn it over and cut the rest of the way through. And wear safety glasses! When it shatters, it really goes everywhere. And it's hot when you cut it, lots of fun. I've built a few cases out if acrylic. I typically used 3/16" or 1/4" thickness and would laser cut everything. That works the best IMO. I'll try to find some old pics - they're probably on here somewhere. qu.one very nice work! Wish I had a laser cutter. One other thing I did with some of mine is, after cutting with the table saw, if you hit the edges with a torch, the acrylic becomes clear-ish again. I'm currently working on a system using "edge lit" acrylic to make lit panels that can be used under any sort of lighting. I did have access to a laser cutter before and found that a deep etch would yield very impressive results. Some of those materials were really cool as they were clear/neutral in appearance but their edge turned a very brightly colored hue once lit. I wonder if the panel graphics are laser etched or silk screened. I found some pictures of another ambitious looking project. Look at the thickne$$ of those panels!